Granted I’m biased, however I’ve witnessed over the years that most people, men and women, find George Rodrigue downright charming. It’s something about that Cajun accent combined with the Snagglepuss laugh and his down-to-earth demeanor that reels in both friends and strangers alike. This is a handy character trait regarding his business. For years George sold his art himself, either on the road from the trunk of his car or from his gallery in Lafayette, Louisiana. Even today, although our capable staff handles the transactions, on rare occasions he still turns on the charm to close a sale (and, frankly, because it comes naturally as he describes his art). Although he avoids trading in recent years, early on this wheeling and dealing was a regular part of his business. Oftentimes this was because the person walking through his door had no more money in his pocket than George. If they loved the painting enough and in turn had something interesting to offer, the barter was complete. George tells a story of a young man who visited his gallery on Pinhook Road* during the 1970s. He remembers these early clients because they were scarce. (It was not unusual for an entire week to pass without a person walking through the door.) This shoe salesman from Yazoo City, Mississippi traveled through town once each month, always stopping in for a dose of this charismatic Cajun and his jewel-like black trees. Eventually the two struck a deal. George gave him a painting and received in turn (over the next several years) thirty pairs of shoes. Several years later in a similar scenario, George traded a newly completed painting for a set of shiny chrome rims. Turns out he made a number of these art-for-art trades early on in his career, and as a result we have a wonderful collection not just of art, but also of artist-friends. On one occasion, George got such a kick out of a trade that he painted a picture of the transaction. 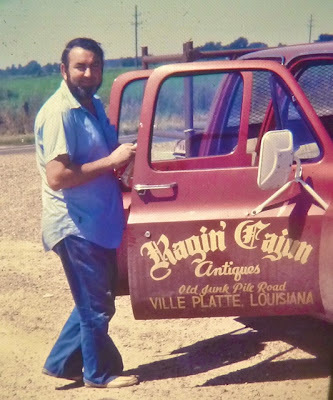 Rodney Fontenot, known as the Ragin’ Cajun,* was an antiques dealer from the tiny town of Ville Platte, Louisiana, specializing in architectural elements such as plantation shutters, fences, and flooring. 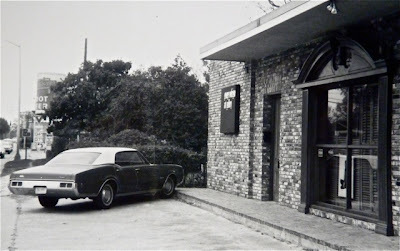 George first met Rodney in the 1970s at his junk shop located off a then-questionable section* of Magazine Street in New Orleans. The two Cajuns hit it off right away, and the Ragin’ Cajun became George’s source for all kinds of (according to George) necessary oddities. 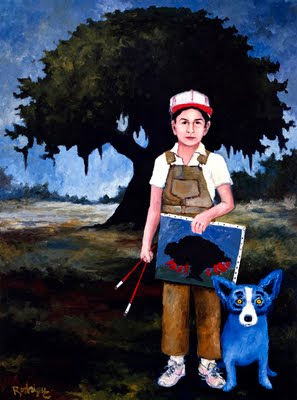 The Ragin’ Cajun does remind me of a later Rodrigue painting, this one featuring George’s son Jacques with the Blue Dog, Paint Me Back Into Your Life. 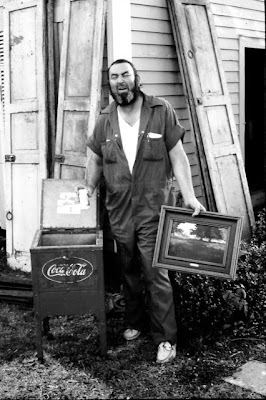 Other memorable Ragin' Cajun acquisitions include an original 1950s barber’s chair* and a Coca-Cola machine, complete with the 7-cents sticker, added when the price of a coke increased by a penny. Today this coke machine sits on display in George’s Lafayette warehouse, a reminder of long lost friends and good ol’ days. Coming this Wednesday: "Nature Girl (The Art of Modeling)"
Thanks Wendy - your blogs are always entertaining and informative! 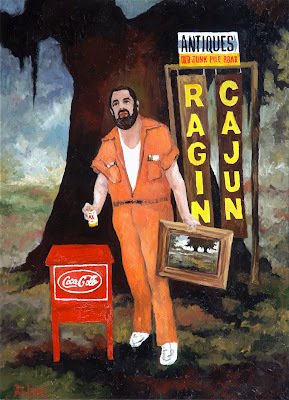 Darn, I just typed a few hundred words about the Ragin' Cajun and my family's experiences with him, and then when I tried to post it, it disappeared. Trying again!! What a great guy! We're from Ville Platte, too, and Mr. Rodney would crunch into our driveway to get some help from one or two of my brothers, and would always stay to tell the most outrageous stories, a naturally gifted raconteur! 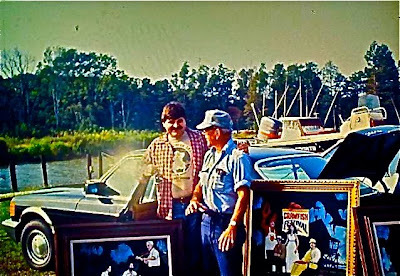 I loved his brightly colored cajun leisure suits (the zip up coverall) and that incredibly thick black beard, wild hair and engaging huge grin! One or the other of my two younger brothers would go off on those summer-time trips with him to South Carolina and all points in between, coming home with some awesome stuff. He had this huge vat of chemicals into which he could place an entire white iron four poster bed, to clean off the old paint and rust, and then lovingly refinish them. I was fascinated that you could pull off the toppers and hide your valuables inside the posts! (My grandmother never let me look inside hers!) I remember a few iron fence stories, too, including the mangling by the 18 wheeler! Thanks for posting this story, Wendy. A lot of wonderful, wonderful memories came rushing back for me. Thank you, Rebecca. I'm always delighted to know that I have loyal readers out there! And Jennifer -- WOW, What a story! I read your comments to George and he laughed out loud. It made him so happy to hear these great memories of his good friend. Thanks for sharing your stories of 'Mr. Rodney.' Sure wish I'd known him. He sounds like quite a character. Wow, thanks Wendy! I'm glad I could get "Mr. George" to laugh out loud!!! I was telling my husband about this post and my comment, and he, a Houstonian who never met Mr. Rodney, said, "Why didn't you tell her about the Hershey PA fence story?" I did not know about that story!! Apparently my brother told my husband about it, and he didn't tell his own sister! Huh! I'll try to wring it out of him soon!!!! My husband can't remember the particulars, of course! Sounds good, Jennifer. 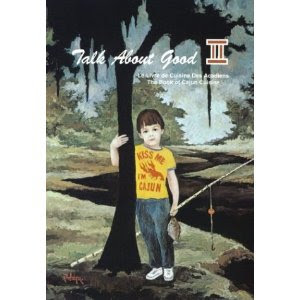 It would be wonderful to have another Ragin' Cajun story added to the post! My Mom knew this guy. Hey there is no "questionable" area of Magazine St.lol. for years we all laughed together.many artists friends and stories. Yes we had some problems at our shops too! I have a funny story about a gallery opening there..Not sure it's ok to post but will. My friend was having an art show in that area, and the NO AIDS TASK force brought a fishbowl of condoms to promote the prevention of the new disease AIDS. While we were watching the artist talk, a group of teens ran in, snatched the fishbown and went running towards St. Thomas..10 guys took off on foot after them in hot pursuit. I who am a nurse by education, a writer and artist by heart, ran out in hot pursuit of the 10 shop owners/artists screaming..No no let them GO , It's a good thing It's a GOOOOODDDDD THING..So they all came running back and we went on with the Good Friday religious painting show. You have to know it and love it. No Place like Lousiana.. Earlier this my wife, Ann, purchased and restored a blue dig riding a motorcycle. I think she may have even posted this on your blog earlier this. It is so beautiful and has become the art centerpiece of our home. 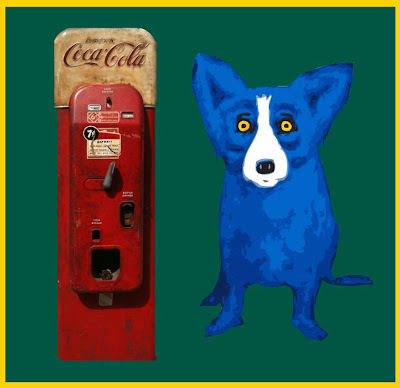 I also really like the coca cola blue dog. How do I get one? We would like to visit the NOLA studio one day next year. If you are available, Ann and I would very much like for you to join us for lunch. P.S. --- We recently purchased a bottle Absinthe......haven't tried it yet......aaaaahhhhh.......eeeeeeee!!!!! There was a Coke machine like that in 1960 at Mt. Carmel in Lafayette. Cokes were 6 cents, and candy (Red Hots, Boston Baked Beans, Fireballs, Necco Wafers) was a nickel.